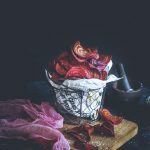 Airfryer Beetroot Chips | How to make Beetroot Chips? Even if you hate Beet, try it!! You will love these Beetroot chips. Wash the Beetroot, peel the skin and set the skin aside. Using a mandoline slicer, slice them thin. Alternatively, if you don't have a slicer, slice them uniformly thin with your knife. Use the skin to dye your prop if you want to or dump it into your food waste. Spread the beetroot slices on the paper and place another paper on top of it. Keep it aside for 10 minutes. This process will enable to absorb any extra moisture on the beetroot thins. Toss the sliced beetroot in oil and sprinkle the needed salt on the beetroot. Preheat the Airfryer to 150 C for 4 minutes. Pull the basket from the air fryer and place the chips in them. Slide it back in the air fryer and fry for 15 minutes. Make sure to remove in between after every 5 minutes and give it a good shake. Once the chips are slightly crisp on the outer edges and tender in the middle, allow them to cool down for some time. Slide the basket with the chips back again and heat at 180 C for another 3 minutes. The chips will be really crisp overall and perfect to much right away. Season with Sea Salt and freshly ground pepper if you like or just munch it as it is.. We love it either way.